detailing the rules for Winter Play which, weather depending, will start on 13 January. Members were circulated today with details of a NEW WINTER SINGLES COMPETITION. Simply decide with an opponent (before you start!) that you would like to have your game count towards the competition and then record your result on the chart in the pavilion. You can play you choice of either 'Level' or 'Handicap' games and you will gain or lose competition points as detailed in the rules. You can play as many or few games as you wish (including playing the same opponent more than once). As this is a winter competition, with wide hoops and our winter play 'NO JUMPING' rule – results will not be recorded on handicap cards. It's just for fun – but there will be the prize of the 'Golf Croquet Tactics' book by Michael Hague for the player with the highest score at the end of the winter season. A waterlogged surface scuppered play on the launch-day of our winter season unfortunately. However the 20 members who had pitched-up to play, enjoyed the mulled wine and nibbles from the warmth of the bridge room rather than courtside. GC all comers will continue on Tuesdays and Thursdays from now on, with Sundays due to be added in from the start of the summer season or as lead by demand (as always, ground conditions depending). Our groundstaff are working hard on the courts at the current time, and members are advised to check with the on-line bookings diary (for which there is a link on the home page, top left corner) to see if closures for maintenance are planned. Roger Goldring had a great day at Hamptworth's latest Handicap tournament yesterday, winning five times and drawing once. That earned him 50 index points and took his handicap from 7 back to 6, and there was even some last shot drama! Roger reports: "Time was nearly up, we were on the tail end of the ‘last 8 balls’, and my opponent had his red quite close to the 10th, ready to run it. I had only one chance and that was with my black ball which was sitting back on the 9th hoop at the side of the court. I carefully took my shot, hoping to hit red or run the hoop, and did actually run it! Jon was very sporting, I have to say." Approximately 40 members gathered for these two events from 11am yesterday. The meeting highlights follow. The lunch was lovely and well organised by Ann Norman. 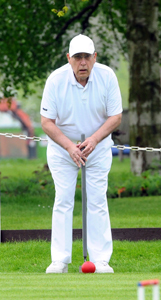 Chairman Harry updated everyone on the condition of the courts, the headline news being that a cockchafer infestation had now been brought under control apparently. A trip to Ascot races on Saturday 9 May was discussed and details will be circulated. In the absence of Raghu Iyer who was poorly, Harry also talked about AC. He encouraged members who had achieved a level of competency with GC to consider giving AC a try this season. Requiring as it does, a different level of dexterity than GC (particularly with shots played lower to the ground), AC is not perhaps for everyone. Coaches Frances Colman and Chris Roberts will be offering an introductory training course for suitable GC players in March, on dates to be announced shortly. (As a guide, 'suitable players' probably with means those with a GC handicap of 8 or less). PCC teams - PCC have again entered a team in the Southern Federation Level League and the Handicap League. Chris Roberts introduced the GC plans for the season - which will be communicated in full to all members by e-mail. (1) GC sub-committee - The composition for 2015 is Chris Roberts, Frances Colman, Ann Norman, Don Rutherford and Richard Peperell. (2) Handicaps - The 2014 system of extra turns will remain unaltered for an extend trial in 2015. (3) Competitions - All seven of our season-long competitions will be unaltered for 2015. (3) Tournaments - All eleven of our single day tournaments will be unaltered for 2015, with one exception - the Restricted '5+ Doubles (for the 'Cave and Wolfe' Salvers). For that last few years the restriction has been that 'both players of the partnership must have had handicaps of 5+ at the time of entry'. For 2015 this has been changed to 'the combined handicap of the partnership must be 10+ at the time of entry'. This means that the event is now open to ALL MEMBERS and it is hoped that the low participation numbers of 2014 will show an improvement. (4) Qualification for National (individual) competitions - PCC players will again be able to qualify via good performances in some of our internal tournaments. (a) We will be doubling our entry for the All England GC Handicap and now four players will qualify for the Area Final stage. (a) We will again enter the National Inter-Club Championship and Shield knock-out competitions. (b) We hope to enter a team to the South-East Croquet Federation's Southern Challenge weekend tournament - depending upon commitment being shown by suitable players. (c) We have entered our usual three teams in the Southern Federation Leagues. - PCC 'A' in the Level League and both PCC 'B' & 'C' in the Handicap League. - Squad personnel will be decided depending upon which players make themselves available for selection for the handicap teams. (d) Our selection policy remains unaltered for 2015. (6) Seeing the Country's Best. - Members wishing to see GC played at the very top level, will be advised of nearby national events - particularly The Surbiton Open in April and The Hurlingham Open in August. The annual GC mail-out to all members took place today (by e-mail), and this included ENTRY FORMS for our season-long GC competitions. (See also the news item 28 anuary below). If anyone has any GC queries about any of this, please call or e-mail Chris Roberts who will be pleased to help. 18 February 2015 - Goldring does it again! Roger Goldring won his second Hamptworth 'Winter Series' GC Handicap tournament in a row last weekend and reduced his own handicap rank still further. He is now a 5. - Well done Roger! 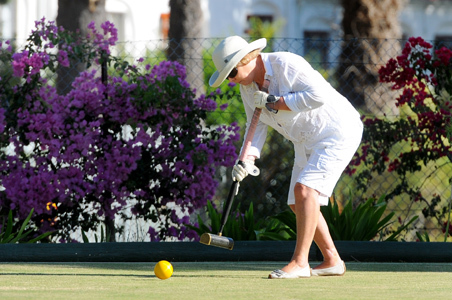 Frances Colman beat the winter blues and enjoyed a successful Southern Cape Croquet Association AC tournament in South Africa last month with victory in 14 point event. Twenty Brits made the annual trip to join local players for the multi-event tournament, that was hosted by the Somerset West Club near Cape Town, which was the club where Frances was first introduced to the AC game four years ago. Chris Roberts also made the trip, had moderate success with 50% wins but a silly error at the end of his last game, robbed him of a good 'scalp' against a much higher ranked opponent. The pair visited reciprocal club Kelvin Grove, and also teamed up with new PCC members Carole Jackson and David Hopkins who will be in Henley for three months from Regatta time onwards. Four players will attend an 'introduction to Association Croquet (AC)' course that is being offered over four days starting on Friday. The older AC game has struggled with numbers in recent years and this initiative is being undertaken to address the decline in the code at PCC, which is reflected nationally, as GC becomes increasingly the game of choice. Chairman Harry wrote to all members today, seeking their views on how PCC should cast our Club's vote on some constitutional changes being proposed by the Council of our National Governing Body, The Croquet Association (The CA). The CA Council is looking for support for changes to the membership rules and the way that the Association is funded, so that it can continue to run the sport effectively. Harry's e-mail explains all, and members are asked to please reply promptly so that our committee can know your view. Participation in our Winter Competition remains slack however,which is odd because there is plenty of action on court, but seemingly a reluctance to record game scores. The enthusiastic quartet of Hugh Crook, Colin Morgan, Philip Allison and Richard Peperell, all performed well during an introduction to AC course run by Frances Colman and Chris Roberts during the past fortnight. Each mastered some new mallet skills, mbraced the principals of the four-ball break and the positive use of bisques to create better break chances. Peperell and Crook are enrolled on further courses in coming weeks and all four players have vowed to attend our Wednesday AC all comers mornings to continue their learning. The riverside pavilion was the venue for our second social function of the season and was fairly well patronised by members, although it would have been nice to have see a few more of you. 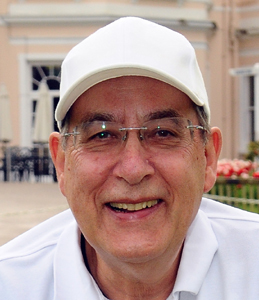 Chairman Harry reported on the decision of the committee to cast our club vote in favour of the changes to the Croquet Association's membership arrangements, following the e-mail consultation with our members. If carried at CA Special meeting on 28 March, the changes would see ALL CROQUET PLAYERS becoming individual members of the Croquet Association. This in turn would see an end to the very favourable (and some would say, far too generous) rate that we ahve been enjoying hitherto for club membership of the Association. The will probably mean that there will be an increase in our own croquet membership subscriptions at PCC, but it will still represent super value which members pay to play bridge and even tennis at PCC. More details on this will follow in due course. Harry congratulated Roger Goldring on his winter achievements at Hamptworth and our four members who have taken to AC with enthusiasm in the past fortnight. Chris Roberts circulated with season-long competition entry forms and rustle up some extra support. Today saw no less than 18 players attending GC allcomers' this afternoon with everyone enjoying a lovely spring afternoon. All comers sessions are held every Tuesday and Thursday afternoons, - and Sunday will be added as usual in April. Our qualified coaches will be taking 11 newcomers through their paces at the annual GC begginers four-day training course on 9,10, 13 & 14 April.